The oldest-known dinosaurs are dated as Carnian (Late Triassic, 230-220 Myr ago) and they include forms such as Eoraptor and Herrerasaurus from Argentina (see p. 154) and Coelophysis from North America. One of the most abundant Late Triassic dinosaurs was Pla-teosaurus. The first specimens were found in southwestern Germany in 1837, and since then dozens of skeletons have been collected from over 50 localities in Germany, Switzerland and France, mostly dated as mid-Norian (c. 215Myr ago). The best locality was Trossingen, south of Stuttgart, where 35 skeletons and fragments of 70 more were excavated from the Lowen-stein Formation (Yates, 2003a). The skeletons are of young and old animals, and many have been broken up by scavengers and by water movement. 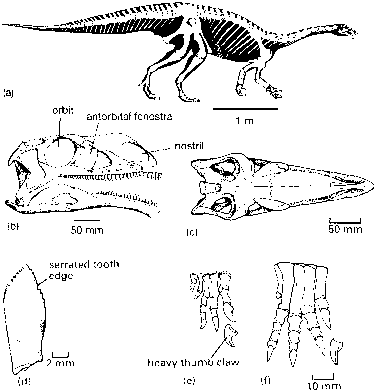 How did the mass grave of Plateosaurus skeletons at Trossingen arise? There have been three suggestions. 1 A herd of Plateosaurus perished while migrating across an arid desert in search of plant food. Against this romantic image is that there is no evidence for desert conditions; the enclosing sediments represent water-laid mudstones. 2 The animals died at different times and in different places, and they were washed into a mass concentration in a major river system. This is commonly the case with dinosaur accumulations, but seemingly not here. 3 The animals died where they are now preserved,perhaps by miring in unconsolidated mud (Sander, 1992; Hungerbuhler, 1998). Evidence is that the skeletons are generally complete and unbroken, and many of them sit in a belly-down position with their feet trapped beneath. Plateosaurus (Figure 8.1) is about 7 m long and could have adopted either a bipedal or a quadrupedal posture. The body proportions are typical of early dinosaurs: a long tail, long hindlimbs about twice as long as the arms and a long neck, but the skull is small and the limbs are heavily built because of its large size. Plateosaurus shows advanced dinosaurian characters of the limbs and vertebrae: upright posture, slender pelvic bones and distinctive vertebrae in the neck, trunk and the lower back. (Figure 8.1(b, d)). This was disputed at one time because some skeletons were found in association with dagger-like teeth that suggested a diet of meat. These carnivore teeth have been identified (Hungerbuhler, 1998), however, as those of rauisuchians, phytosaurs and theropod dinosaurs that were scavenging on pla-teosaur carcasses and had shed their teeth when biting on bones, a common enough phenomenon among sharks and crocodilians today. The teeth of Plateosaurus have serrated edges, but these are more like the teeth of herbivorous lizards that cut up tough plants than the steak-knife teeth of true carnivores. The jaw joint in Plateosaurus is set low (Figure 8.1(b)), an adaptation seen in herbivorous synapsids (see p. 121) and other dinosaurs (see p. 206) which gives a sustained and evenly spread bite along the tooth row, useful in dealing with tough plant stems. Plateosaurus swallowed its plant food whole and could not chew it as modern mammals do because side ways jaw movements were not possible. It avoided indigestion by the use of a gastric mill. Just as chickens today swallow grit that lodges in the gizzard (a muscular expansion of the gut above the stomach) and grinds the food up, the plateosaurs swallowed pebbles. 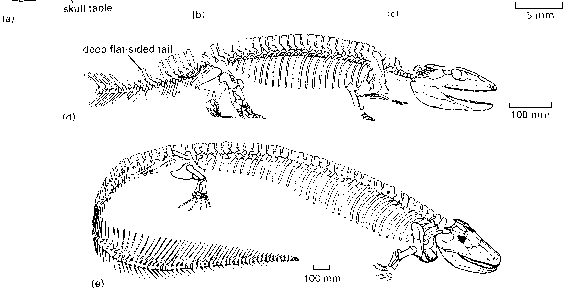 This is shown by finds of gizzard stones, or gastroliths, inside the upper rib cage of plateosaur skeletons. A herd of feeding plateosaurs must have rattled, grunted and burped furiously as their rough plant diet was reduced to a digestible state!